We're moving fast and furious with actual college football games starting tonight and ND on tap for Saturday. Make sure to check back later today for the defensive backs preview and, sometime later tonight/early Friday, the wrapup summary post, along with where ND would fit into these position rankings. If you're just catching up to speed, here are the links for quarterback, running back, wide receiver, offensive line, tight end, and defensive line. Standard disclaimers apply. The number in parenthesis is where Phil Steele ranked a player at that position. He only ranked NFL Draft eligible players, so no freshman or sophomores are listed. For the stat lines, TFL=tackles for loss, FF=fumbles forced, and FR=fumbles recovered. SLB - James-Michael Johnson. RS Sophomore. Returning Starter. 2008 stats: 48 tackles, 1.5 sacks, 12.5 TFL, 1 INT, 1 FF. MLB - Mike Bethea. Senior. New Starter. 2008 stats: 29 tackles, 1.0 sacks, 4.5 TFL, 1 FR. WLB - Brandon Marshall. RS Sophomore. New Starter. 2008 stats: 33 tackles, 2.0 sacks, 8.5 TFL, 1 INT, 1 FR. Redshirt soph James-Michael Johnson was an instant hit, starting 10 games as a redshirt sophomore. His 12.5 TFL were good for 3rd on the team. Senior Mike Bethea started three games in his first season at Nevada after transferring in from junior college. Foot injury cost him the rest of the season but he is now healthy and at 6'3" 245 pounds has ideal size for a middle linebacker. He played outside last year, but the team leader has moved to the middle to help anchor the Wolfpack defense. At Nevada, WLB stands for Wolf Linebacker, which this season is redshirt sophomore Brandon Marshall. He did start 6 games last year and picked up a decent amount of tackles for loss during his time on the field. Depth: Marshall's backup is redshirt junior Kevin Grimes, who is a converted defensive back, is a bit light at 215 pounds, but undoubtedly is quick. Redshirt junior Adam Lirazno played in every game last year and will likely see plenty of time again as a backup middle linebacker. OLB - Stevie Brown. Senior. Returning Starter. 2008 stats: 64 tackles, 1.0 sacks, 1.5 TFL, 2 INT, 1 FR, 2 FF. MLB - Obi Ezeh. (#9) RS Junior. Returning Starter. 2008 stats: 98 tackles, 1.0 sacks, 7.0 TFL, 1 INT, 1 FR. WLB - Jonas Mouton. (#20) RS Junior. Returning Starter. 2008 stats: 76 tackles, 1.0 sacks, 6.5 TFL ,1 FF. Quick - Brandon Herron. RS Sophomore. New Starter. Michigan's defense will feature four linebackers in 2009, with one of them being a hybrid 'backer/defensive end called the "Quick". The concern for UM fans should be the lack of overall depth at the position. The starter at the Quick this year is redshirt sophomore Brandon Herron. It will be interesting to see how he's used because at 6'2" 220 pounds, he's not that big for a linebacker, let alone hybrid defensive end. The top man for the Wolverines will be mike 'baker Obi Ezeh. He led the team in tackles last season and will likely do so again. Redshirt junior Jonas Mouton is back after starting nearly every game at the weakside 'backer spot last year. His responsibilities might be a bit different this season, but he should still be effective. 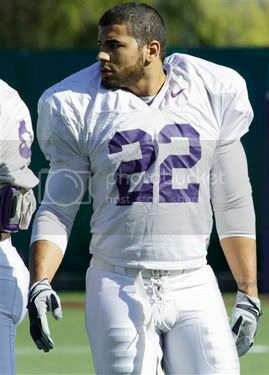 Senior Stevie Brown was a starting safety last year and had his share of mistakes, but is still in the starting lineup. What has changed is that he is now playing a hybrid linebacker/safety spot. Depth: Like at DL, Michigan is young and thin at linebacker. Freshman Craig Roh is the backup at the Quick spot and may even be a better long-term fit than Herron. Both backups at weakside linebacker behind Mouton are also true freshmen in 203 pound Mike Jones and 190 pound Floyd Simmons. The backup middle linebacker is sophomore J.B. Fitzgerald. SLB - Eric Gordon. (#23) RS Junior. Returning Starter. 2008 stats: 85 tackles, 3.0 sacks, 7.5 TFL. MLB - Greg Jones. (#8) Junior. Returning Starter. 2008 stats: 127 tackles, 2.0 sacks, 14.0 TFL. WLB - Brandon Denson. RS Senior. New Starter. 2008 stats: 31 tackles, 1.5 sacks, 1.5 TFL. A very good linebacking corp features one of the best linebackers in the country. Junior Greg Jones is the preseason Big10 Defensive Player of the Year and has led the Spartans in tackles his first two years on campus. He played outside linebacker last season but is set to man the middle for 2009. Redshirt junior Eric Gordon has 23 career starts with two years of eligibility left. Last season he was second only to Jones in total tackles. Strong against the run and pass, Gordon is a very good linebacker paired up next to an excellent one. Brandon Denson is the lone new starter after two seasons of primarily starring on special teams. Teams will likely run his way and away from Jones and Gordon. Depth: Redshirt senior Adam Decker is the backup to Jones, but started eight games last year at middle linebacker while Jones was on the outside. Decker finished fifth on the team in total tackles. Freshman Chris Norman is the backup strongside linebacker behind Gordon while 207 pound junior John Misch is the backup behind Denson. SLB - Jason Werner. RS Senior. New Starter. MLB - Chris Carlino. Sophomore. New Starter. 2008 stats: 36 tackles, 0.5 TFL, 1 FR. WLB - Joe Holland. RS Sophomore. Returning Starter. 2008 stats: 76 tackles, 1.0 sack, 2.0 TFL. As the Big10 moves to more and more spread offenses, the linebackers are getting lighter. Nowhere is this more evident than at Purdue where 221 pound redshirt senior Jason Werner is the biggest starting linebacker. Werner has battled back injuries his whole career and missed the 2006 and 2008 season because of them. Now he's healthy and will need to shake off the rust and be a veteran leader of a young linebacker corp. Sophomore Chris Carlino played in every game his freshman year and even started five. He should be better after an off-season of weight training, but he's still extremely light for a middle linebacker at 215 pounds. 220 pound Joe Holland is the only returning starter at linebacker after starting every game last year at the weakside position. Depth: Purdue joins other teams on the schedule with multiple freshman manning backup spots at linebacker. Freshman Dwanye Beckford is the second string middle linebacker while big 6'3" 248 pound freshman Antwon Higgs is the backup strongside linebacker. Both Beckford and Higgs did enroll early so they at least have spring practice under their belt. SLB - Mason Foster. (#64) Junior. Returning Starter. 2008 stats: 105 tackles, 1.0 sack, 12.0 TFL. MLB - Donald Butler. (#46) Senior. Returning Starter. 2008 stats: 69 tackles, 2 sacks, 7.0 TFL. WLB - E.J. Savannah. (#66) RS Senior. Returning Starter. The Huskies return two linebackers who led the team in tackles. Junior Mason Foster had 105 to top the team last season while redshirt senior E.J. Savannah had 111 in 2007. 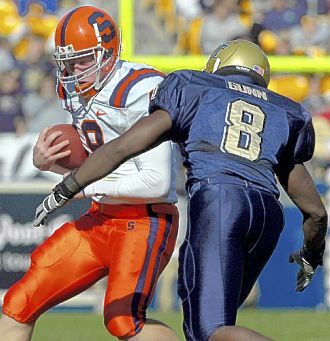 Savannah was suspended for the 2008 season but was reinstated and should pick up where he left off in 2007. Foster meanwhile will probably see a slight reduction in his tackle total with Savannah on the field, but after leading the Pac-10 in tackles per game last season, he'll still be a very dependable linebacker. Senior Donald Butler started at both outside and inside linebacker last season during his 11 starts, but will settle into the middle spot. At 6'1" 235 pounds, Butler isn't the biggest inside linebacker, but his quickness helps him avoid blocks from offensive lineman. Depth: 6th year senior Trenton Tuiasosopo has started 15 games in his career, so the 241 pounder will provide some solid veteran experience coming off the bench at middle linebacker. Redshirt Josh Gage started four games last year and has played extensively as a backup the past two seasons as an outside linebacker. SLB - Michael Morgan. (#34) RS Junior. New Starter. 2008 stats: 24 tackles, 1.0 sack, 5.0 TFL, 1 FR. MLB - Chris Gallipo. (#10) RS Sophomore. New Starter. 2008 stats: 12 tackles, 2.0 TFL, 1 INT. WLB - Malcolm Smith. (#40) Junior. New Starter. 2008 stats: 18 tackles, 0.5 TFL. Most news about SC's 2009 defense starts with the wholesale replacement of last year's All-American linebackers. The book on the new trio is that while they lack experience and will likely make a few mistakes here and there, they are overall a faster unit than last year's group. Redshirt sophomore Chris Gallipo was a star recruit and finally gets his chance to start after battling through two back surgeries his first two years on campus. 220 pound Michael Morgan has spent the last two seasons playing in nearly every game off the bench, so the transition to starter shouldn't be too much of a jump for him. Junior Malcolm Smith was rather impressive in relief duty last season. He's extremely fast and active, which contribues to the idea of this corp of 'backers being a faster set than last year's. 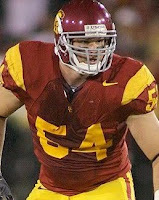 Depth: The Trojans are young at linebacker with two freshmen, Jarvis Jones and Kevin Greene, as backups behind Morgan. The depth took somewhat of a hit when former star recruit Luthor Brown (#20) was declared academically ineligble. The lack of depth forced 210 pound redshirt sophomore Shane Horton to convert from safety to linebacker, where he is now the backup weakside 'backer. SLB - Dominick LeGrande. Sophomore. New Starter. MLB - Luke Kuechly. Freshman. New Starter. WLB - Alexander DiSanzo. RS Freshman. New Starter. A stretch of bad news hit the BC team with the loss of star linebacker Mark Herzlich (#5), who was diagnosed with Ewing's sarcoma in the spring. Then veteran middle linebacker Mike McLaughlin (#69) injured his Achilles. He may be back later in the year, but for now is still rehabbing. Starting in his place is true freshman Luke Kuechly. The 6'3" 225 pound Kuechly earned strong reviews for his play in fall camp, but will still be a freshman taking on upperclassmen offensive lineman at a very physical position. Redshirt freshman Alexander DiSanzo is the second BC 'backer who will be a starter without the benefit of having played in a college game yet. The one starter who has played is starter Dominick LeGrande. However, it was mop up duty at safety. Now the 218 pounder is the starting strongside linebacker. The former high school quarterback should have the speed to keep up with tight ends running down the field, but will be at a size disadvantage against the run. Depth: The normally veteran-laden Eagles are very young at linebacker with no seniors in the two deep and only one junior, 219 pound middle linebacker Mike Morrissey. 2008 stats: 44 tackles, 1.0 sack, 4.0 TFL, 1 INT, 1 FF. MLB - Alex Hoffman-Ellis. RS Sophomore. New Starter. WLB - Jason Stripling. RS Senior. New Starter. Senior Andy Mattingly is back at linebacker after a failed experiment at defensive end last season saw his stats drop from 91 tackles and 8 sacks in 2007 to 44 tackles and 1 sack in 2008. One of the team leaders, the 6'4" 255 pound Mattingly should be more productive at his more natural position. The new man in the middle is JUCO transfer Alex Hoffman-Ellis. He sat out last season so he'll have to shake off the rust in a hurry as the man in the middle of the Cougar defense. Redshirt senior Jason Stripling played in 10 games as a freshman in 2005 and then through a combination of academic trouble and a 2008 shoulder injury has only played in 3 games in the past three seasons. Now he's a starter, so he'll have to re-acclimate in a hurry. Depth: Sophomore Louis Bland was one of the few bright spots last year, cracking the starting lineup early and winding up fifth on the team in total tackles. Undersized at 5'10" 202 pounds, Bland was still effective, picking up nine tackles for loss. Once he recovers from a knee injury that has slowed him during fall camp ,he will likely get right back into the starting lineup. For now he's listed as the backup at both WLB and SLB. Continuing the theme of young backups, true freshman Darren Markle is the backup middle linebacker at 224 pounds. 2008 stats: 33 tackles, 3.0 sacks, 3.0 TFL, 2 INT, 1 FF, 1 FR. 2008 stats: 109 tackles, 3.0 TFL, 2 INT, 3 FF, 2 FR. ILB - Tony Haberer. Senior. New Starter. 2008 stats: 41 tackles, 1.0 sack, 1.0 TFL. 2008 stats: 60 tackles, 4.0 TFL, 1 FR. Navy's 3-4 defense will feature four veteran linebackers where all starters and the top reserve are all seniors. ND fans certainly remember senior Ram Vela flying through the air to sack Evan Sharpley on 4th down in 2007. With 17 career starts, Vela has developed into more than a situational pass rusher off the edge. Navy's leading tackler last season, senior Ross Pospisill is a team captain and defensive leader. Aggressive and bigger than some of the other middle linebackers on this list at 227 pounds, Pospisill will lead the experienced 'backer group. The only senior who could be considered a new starter is Tony Haberer. He still started five games last year so he's played plenty. Clint Sovie has started 19 games for Navy and it would have been even more had he not been lost for nearly the entire 2007 season due to injury. In his final go-round, one of the strongest players on the team will move from the inside to the outside to add even more veteran presence to an experienced group of linebackers. Depth: Senior Craig Schaefer was a starting linebacker coming out of spring, but will start the year coming off the bench. He started two games last year and will rotate in frequently at outside linebacker to keep the other players fresh. 2008 stats: 47 tackles, 3.5 sacks, 6.5 TFL, 2 INT. WLB - Max Gruder. RS Sophomore. New Starter. Redshirt senior Adam Gunn started every game at the strongside spot in 2007, but a neck injury knocked him out for effectively the entire 2008 season. He also missed spring ball while healing, but will have plenty of time to shake off the rust before facing ND. He will move to the middle after playing on the outside the past five seasons, but the transistion shouldn't be much for such a veteran player. Redshirt sophomore Max Gruder played in every game last year, mainly on special teams, but only picked up five tackles. Coaches are high on his potential, but he'll have to up his production now that he's starting. Injury to the starter bumped redshirt sophomore Greg Williams into the starting lineup and he didn't dissapoint over the his 12 starts. At 6'3" 240 pounds he's a big strongside linebacker and, as a recruited running back, has enough speed to do just fine in coverage. Depth: Redshirt senior Shane Murray started every game in 2007 at the weakside spot, but, similar to Gunn, a knee injury in the first game cost him the rest of the season. As he gets more comfortable with his rehab, he could move back into the starting lineup and give Pitt a boost in experience. Pitt's backup middle linebacker is 225 pound true freshman Dan Mason. 2008 stats: 106 tackles, 9.0 TFL, 1 INT. 2008 stats: 56 tackles, 1.0 sack, 7.0 TFL. 2008 stats: 73 tackles, 1.0 sack, 6.0 TFL, 3 INT, 1 FR. Three starters return to a Husky defense that was 16th in the nation against the run last season. With a revamped defensive line, that number might slip in 2009, but the linebackers will still be very tough to beat. Big 244 pound redshirt junior Scott Lutrus has started every game the past two seaons and is one of the best linebackers in the Big East. He led the team in tackles last year and is a safe bet to do so again. His competition will be redshirt junior Lawrence Wilson, who was second on the team in tackles last season. His three interceptions are a big clue that he excels dropping into pass coverage. Another stout Husky 'backer, 245 pound middle linebacker Greg Lloyd, will hold down the center of the field and pick up any tackles that Lutrus and Wilson leave. Depth: There is a definite dropoff in size at the strongside spot where 211 pound redshirt freshman Jory Johnson backs up the stellar Lutrus. There is equal inexperience at the other outside spot in 219 pound redshirt frosh Sio Moore. SLB - Will Powers. RS Senior. New Starter. MLB - Clinton Synder. (#8 OLB) RS Senior. Returning Starter. 2008 stats: 58 tackles, 3.0 sacks, 6.5 TFL, 1 FR, 3 FF. WLB - Chike Amajoyi. Junior. New Starter. 2008 stats: 51 tackles, 2.0 TFL. 6'4" 240 pound redshirt senior Clinton Synder might be the most experienced linebacker in this preview with 34 career starts to his name. He is moving inside this year, but has plenty of size to continue to be an effective 'backer. Redshirt senior Will Powers has been largely a career backup to this point, but he did pick up his first two starts last season. At 6'4" 240 pounds, he's a big 'backer like Synder, which suits the strongside spot. Junior Chike Amajoyi did start five games last year while playing as a backup so it shouldn't be too much of a jump for him to take over the starting weakside spot. At 235 pounds, he joins Powers and Synder to give Stanford the biggest linebacker corp that ND will face. Depth: It gets young in a hurry on the Cardinal depth chart. True freshman Shane Skov is the backup middle linebacker, where the top recruit will likely be a mainstay in years to come. 215 pound true freshman Jarek Lancaster gives up plenty of size at the strongside spot compared to Powers, so his first action in a rotation might be on obvious passing downs. There don't really appear to be any superstar linebackers, save Greg Jones on the list this season. That's good new for the Irish offense. The bad news is that there are still plenty of veterans who will be more than capable against the Irish. Overall though, you get the sense that a lot of the teams are rebuilding their linebacker corps. As many of these corp are being rebuilt, it's obvious that the spread offenses are having huge impact on the size of linebackers. There are more 220-225 'backers on this list than I can remember seeing before. It seems that teams always used to have a big "thumper" type in the middle who was built to battle the fullback and offensive guards all game long. Now the middle 'backer might be a converted outside guy who has the speed to cover sideline to sideline, not to mention back in pass coverage. The obvious thought is that, yes, ND should focus on running the ball repeatedly to wear down the faster, smaller linebackers. They will probably be more effective against runs to the outside, not to mention screens, but if James Aldridge is going to be effective blocking up the middle as ND's new fullback, at least he gets the luxury of not facing too many middle linebackers who are all that much bigger than him. With all the talk about ND's frosh celeb 'backer Manti Te'o, it was sort of surprising to see just how many other programs had freshman already establishing themselves in the two-deep. Nevada, Washington, Navy, and UConn are the only opponents in 2009 who don't list a freshman on the official depth charts for opening day. Add in redshirt freshmen and UConn falls from the list as well. That's a lot of inexperience in the depth chart. Let's take a look at the rankings. As usual, the middle is pretty murky with arguments to be made that multiple teams deserve higher, or lower, rankings . 1. Michigan State - Jones leads a talented and veteran unit. 2. Washington - Plenty of experience aided by the return of the talented Savannah. 3. UConn - Perhaps one of the sleeper linebacker units in the country. 4. Southern Cal - Not much proven production thusfar, but some extremely talented athletes. 5. Michigan - Look better on paper than they did last year. The Brown experiment at LB is interesting. 6. Stanford - Some tough vets, competent replacement starters, and promising frosh. 7. Navy - A veteran Navy corp with plenty of speed and athleticism. 8. Pitt - If Murray and Gunn are 100% healthy, this unit deserves to move up the rankings. 9. Nevada - New starters will need to keep up the strong run D while improving poor pass D.
10. Purdue - A young corp with not much depth that needs a healthy Werner. 11. Washington State - A long way to go, but a healthy Bland will help. 12. Boston College - Little to no experience now, but will get a big boost when McLaughlin returns.